A couple months ago, I wrote an article about what bicycling on Andrews AFB could be like, providing both low cost and medium cost options that could be combined to improve the culture of bicycling on the base. And boy does it need it. I just discovered this morning that the base PROHIBITS bicycling and jogging on the stretch of Virginia Ave through the golf course. UNSAT! Just got back home from the Northern Virginia Streetcar Coalition meeting. Will post a more fleshed-out article either tomorrow or over the weekend, but for now, here's the collection of Tweets I made from the meeting...you'll catch the basic gist from these. At the NOVA Streetcar Coalition meeting. Curious to see what they're going to put out. Abi Lerner (Alex): CCPY transitway needs to be done in a coordinated fashion btwn Alex & Arlington. Beauregard/Mark Center-BRAC: connect to Columbia Pike? Alex. priority is CCPY/Rte 1 first, then Beauregard/Van Dorn 2nd, then Duke St 3rd. How to accommodate future conversion to streetcar without creating environmrntal impact & preserve flexibility for Federal funding? Alexandria wants to further study future conversions to streetcars before making a final decision. *NO* intent in Alexandria to go with overhead wires. Arlington: mention of 15K/day bus ridership on Columbia Pike. Relating Columbia Pike Streetcar project to Federal policy vision of current administration. Arlington to initiate Federal New Starts process for Columbia Pike soon. Arlington County plan (approved by board as policy) to increase Crystal City density by 68% over today. Arlington has $6M in grants to build their segment of CCPY transitway. Arlington doesn't think there's a viable alternative to overhead wires yet. Still looking to pursue overhead wires. FFX Co Board endorsed long-term goal of rail on I-66 west of Vienna. Plan to build bus ramp from 66 HOV lane to Vienna station. If 28 gets widened, would likely include HOV lanes. Other transit modes unclear/unstudied. FFX comp plan endorses 176' ROW for Rte 1, preserves ROW for LRT in median. No LRT envisioned along 95/395. Mention that 1/3 of inbound 66 traffic in morning is heading to Tysons. MWCOG: big on projects that provide connectivity btwn systems. Mentions 43% of Purple Line users predicted to xfer to/from Metro. Ron Kirby (MWCOG) must've been around for awhile. He called it Shirley Hwy instead of I-395. NVTC: NOVA transit ridership up 3% in FY 2009 over 2008. NVTC: FY 10 transit in NOVA cost $700M. 65% local (including fares), 20% state, 15% Federal. NVTC: per state statutes, VA supposed to cover 95% of transit costs not covered by fares or Feds. They obviously fall far short. I got an E-mail back from the city about the bike box I mentioned in my previous post. It was actually striped by a contractor for the adjacent Triangle property redevelopment and was done as part of that redevelopment. City staff felt a bike box here was justified due to the large number of bicyclists, the signal cycle, and what the city perceives as difficulty for bicyclists making the left turn from SB Commonwealth to SB Mt. Vernon. The city will monitor its use and looks forward to input from users. Right now the city budget is tight, but they are considering adding bike boxes at other locations...I couldn't get a specific list of intersections being considered, though, but I'll keep trying. My cohort at TheWashCycle is reporting that Alexandria has installed a bike box on Commonwealth Ave at the 5-legged mess with Mt. Vernon and Hume Aves. It's purputedly the first bike box in the region. I'll have to get over there sometime to take a look. 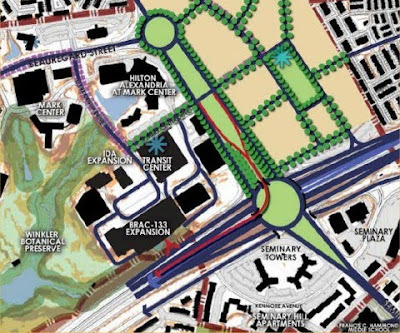 Last month, I described one of the new alternatives proposed by the BRAC Advisory Committee for the BRAC-133 project at I-395/Seminary Rd/Mark Center. But at the time, there were no online maps and all I had was a paper copy of the proposed concept. After some further searching, I found this PDF on the city's website, which shows maps of the new alternative, also shown in the graphics below. 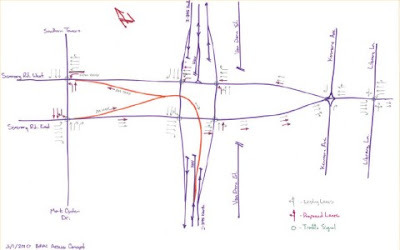 This first image shows the interchange concept in relation to the surrounding area. Of note are both the removal of the existing Seminary Rd flyover, and the traffic circles on Seminary at both the I-395 ramps and at Beauregard St. Both traffic circles are optional, but given the high traffic volumes both would likely have to be signalized even if they were built. This second image shows a sketched out lane schematic, detailing the turn and through lane changes associated with the alternative. Note that, due to the removal of the existing Seminary Rd flyover, an additional lane each way is added along what is now the Seminary Rd ramps to I-395. There's also a second alternative being suggested, which can be found on page 5 of this PDF. Lastly, there's a PDF showing the wide range of conceptual alternatives originally considered for the project. The bulk of last night's Alexandria Transportation Commission meeting was about two street items: Street Smart, and Complete Streets. The Complete Streets item in particular has been long-awaited. A subcommittee of the Commission met last month to evaluate the 10 elements that comprise Complete Streets (on page 2), and also drafted up a proposed ordinance...some members of the Commission think a Complete Streets policy would "have more teeth" if it was codified into the city code, and I'm inclined to agree. There's the thought that many various plans (including the city's Master Plan and the various Small Area Plans) make mention of Complete Streets elements, but there's nothing that "brings it all together". It's also thought that a Complete Streets ordinance would have more permanence. The draft ordinance is available online (pages 3-4), and the goal is to have the ordinance before City Council by September (give or take a month). There's a few reason for the delay. The Commission wants to bounce it off the city's attorneys to make sure everything lines up all legal-like before it goes to Council (small steps early will save the need for bigger steps later). There's also the relation to the city's new Strategic Plan, which is expected to be approved this summer and makes specific mention of Complete Streets. And there have been a few questions already brought up, mostly related to definitions, about Complete Streets. For example, Jonathan Krall (who posts occasionally on area blogs) sent the city a letter that questions what the definition of "appropriate accommodation" is, and suggests that it be defined as "one that is everywhere visible, accessible, and connected". His concern mainly relates to connectivity for bikes and pedestrians...namely that they could come to the end of a facility and "perceive no safe way to proceed other than to turn around and return from whence they came". Jon's wasn't the only concern about definitions. A Commission member voiced concern about the general lack of definitions in Complete Streets policy. Another made mention of a public question about the definition of "accessible transportation". A member of an area citizen's health group (I missed both her name and the group she represented) thanked the Commission for its pursuance of a Complete Streets policy, and also requested that the ordinance includes mention of the public health benefits of Complete Streets. The meeting then moved on from streets that are complete to streets that are smart. City staff gave a brief update on the Street Smart Campaign which is currently ongoing. This is a regional collaborative on both sides of the Potomac to raise awareness of traffic safety and laws for all modes. It includes driver/bike/pedestrian education (including a TV ad that is running on area cable stations) and increased enforcement of all modes (not just ticketing drivers, but pedestrians and bicyclists who don't follow traffic laws). There was a question of how this ties in to the US DOT and Ray LaHood's recent focus on distracted driving. There apparently is no direct connection, but there is certainly some correlation between the two since they serve similar purposes. Relating to Alexandria specifically, members of the Commission requested a brief on bike/pedestrian crash hotspots within the city. City staff had two maps posted at the meeting of bike/ped crashes within the city (the ones on pages 15-16 of this document), and the request is for further elaboration on those crash hotspots. The program in Gainesville, FL mentioned earlier in the week by GreaterGreaterWashington was also mentioned at the meeting...posting signs showing traffic compliance statistics to "guilt-trip" drivers into obeying traffic laws. My one concern with the Street Smart Campaign: if you truly want it to be effective, you can't just do a one-month enforcement blitz twice a year. You need continuous enforcement of the traffic laws. And even though this Spring campaign has been going on for 3 weeks, I have yet to see any traffic enforcement in Prince George's County. Time to get with the program, PGC. Wrap-up note...a few items related to the proposed city budget were mentioned. The city's still looking for ways to reduce expenditures to help address the $44 million budget gap for FY11. Current proposals related to transportation are for reductions in sidewalk clearing (which mainly involves Old Town and Mt. Vernon Ave) and maintenance, parking meter maintenance (concern that this could backfire and cost the city parking meter revenue), bus shelter cleaning, development review, and traffic calming (mainly maintenance of traffic calming fixtures). The city also proposes raising the parking meter rates in Old Town from $1/hr to $1.25/hr (makes it comparable to Eisenhower Ave) and increasing rates for DOT Paratransit for those trips that go more than 6 miles outside the city. Although the WMATA subsidy is currently being held flat, there's enough flexibility in the proposed tax rate to accommodate a $1.6 million subsidy icnrease if that goes through. Unfortunately, the city's budget process wraps up before WMATA's budget process, so there's a bit of a time disparity mucking up the waters here. Lastly, after last month's meeting, I had explained the Add-on Commercial Property Tax, which is an additional property tax on commercial property (approved by the General Assembly a few years ago) that the city can levy to expand transportation options. It's probably not going to happen this year. The general feeling amongst City Council (as explained last night) is that the city needs a clear, articulated, and expanded project list that includes the project impacts on and benefits to the businesses that would be paying the tax. The existing project list (explained last month) is a start, but is apparently not good enough. It can't be ruled out entirely for this year, but it's not looking likely either. It was reported at the end of last night's Alexandria Transportation Commission meeting that the city received a letter from VDOT about the BRAC-133 project (I-395 access at Seminary Rd/Mark Center). VDOT is apparently agreeing to not only drop Alternative A1 (which the city first supported, but more recently the BRAC Advisory Group opposed), but also Alternative D as well, which the city has long opposed due to its impact on the Winkler Preserve. VDOT also agreed to consider the two alternatives recently proposed by the BRAC Advisory Group (one of which I described after last month's meeting). However, in true VDOT fashion, they're asking the city for money to further study these new alternatives. I didn't catch everything relating to how to fund that, but the city is looking at various sources to fund further study. Still, this is a positive response from VDOT, who in the past (and as recently as last month's public hearing) tends to try to ramrod projects through.